Hitachino Nest Weizen is a 5.5% hefeweizen style beer from Kiuchi Brewery, based in Ibaraki prefecture. It’s brewed using Cascade, Chinook, and Amarillo hops during the boil stages, giving it an American influence. At the time of writing, the beer can be found in both regular 350ml and 750ml bottles as well as on draft. 24 bottles later and a review finally. There’s no better way to try a beer than getting given a 24-pack of the beer and drinking it until the end. It’s also a good way to find out if you really like a beer as well. 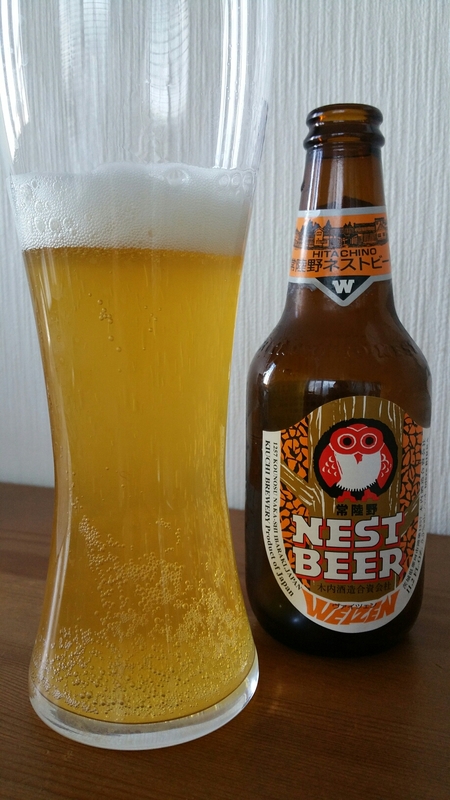 Hitachino Nest Weizen poured out a light golden colour with a distinct clearness to it as the light shone through it. There was a reasonable amount of head on top but nowhere near as light or fluffy as I have grown accustomed to while drinking weizens. It had a strong aroma of bananas with some hints of cloves but perhaps happily / disappointingly, the hops used didn’t come through at all. There was a distinct wheatiness to it with some tones of cloves – a regular weizen by all means. The body didn’t stand out much either on the first try or the twenty-fourth try. The wheat flavour was balanced nicely with a fruity yeasty banana flavour to it and a slight bitterness to it in the aftertaste. I would have liked some more of the sweeter flavours to come through in the aftertaste though. Hitachino Nest Weizen One Line Review. It’s not outstanding nor groundbreaking but after 24 bottles I can say I like Hitachino Nest Weizen. That’s it.